The beauty of making things from scratch is that you know exactly what’s gone into it. It’s also a great way to make a gift that’s personalised and thoughtful. With Mothers day just around the corner here are a few body scrub recipes you can try at home. It’s super easy and fun! All you need to do is fill a small glass 2/3 full of either sugar, coffee or salt – depending on whether you want fine or coarse exfoliation. Add the remaining ingredients. Slowly pour Meraki’s organic Pure Oil with orange and geranium into the glass storage jar while stirring the mixture. Then add a personalised gift tag and spoon as a finishing touch. Sugar is natural and can be used for many things other than just easting it. Try this sugar scrub which will leave your skin feeling smooth, moisturised and fresh. Avoid throwing away your coffee grounds after your morning coffee. Instead, we recommend that you use them to make this wonderful DIY coffee scrub. The coffee grounds possess an exfoliating effect, thus invigorating and boosting the skin with extra glow and shine. 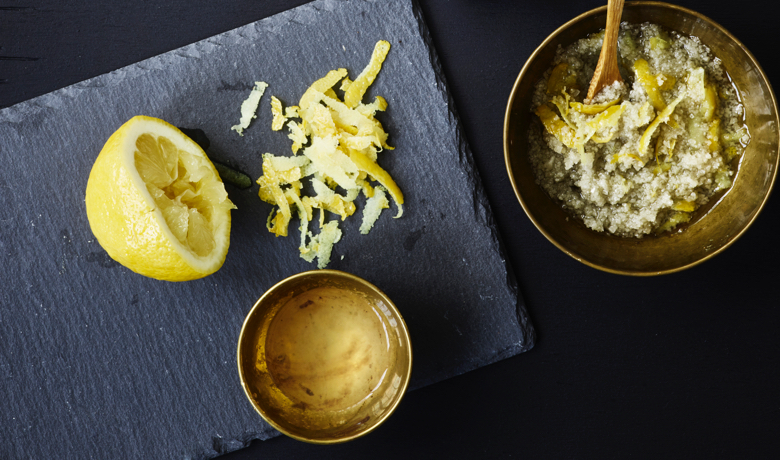 Try this refreshing salt scrub with lemon that will exfoliate your skin thoroughly and remove dead skin cells. Experience the invigorating effect that the lemon provides and feel more energised.